Millions of businesses understand what’s happening internally, but they’re blind to what’s happening outside the four walls of their company. Most companies have awesome data on their own marketing campaigns, lead generation efforts, product roadmaps, budgets and hiring plans. 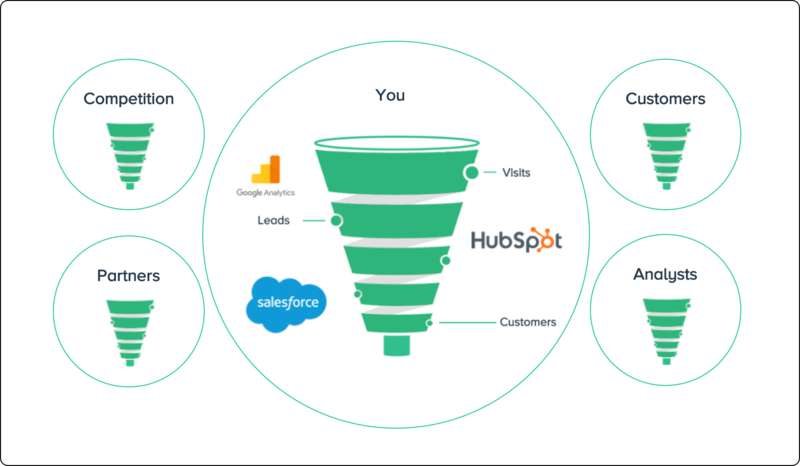 They use mature products like HubSpot and Salesforce.com to track and optimize their efforts. But when it comes to understanding and acting on what’s happening externally - with competitors, customers, and partners - many companies are radically underinvested. When it comes to understanding what’s happening in the market, most companies operate in an informational vacuum. How are competitors shifting messaging and positioning? 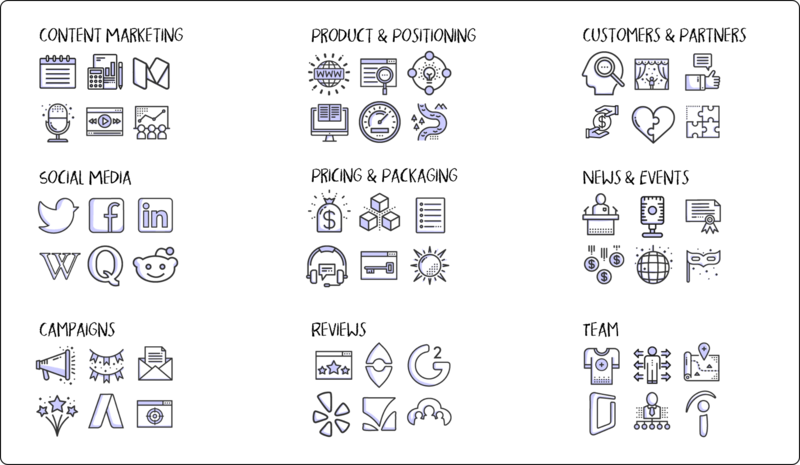 What are the most meaningful product and pricing changes in your market? Are companies in your space shifting marketing investment to new platforms? What’s their hiring plan? What’s their partner strategy? Are they winning or losing customers at an accelerated rate? What content strategies are working for them? Most companies can’t answer these fundamental questions. They operate as if they’re alone in the market. The best companies in the world are investing in capabilities to bridge this internal-external information gap. There’s a massive opportunity for millions of companies to find actionable insights and opportunities using market intelligence software. We’re building Crayon to help every company on the planet tune into actionable market intelligence hidden in plain sight, outside the four walls of their company. Why aren’t most companies doing this already? What’s stopping the majority of companies from gathering and acting on market intelligence at scale? Most companies are on the sidelines because actionable market intelligence is hard, and there’s never been a software platform that solves the problem. It’s historically been very difficult to track thousands of data sources and extract meaningful signal without being overwhelmed by the noise. It’s even harder to translate market intelligence into actionable, ROI-positive opportunities for the company. The digital footprint for a modern company – all the places online where that company has a presence – is large, distributed and complicated. 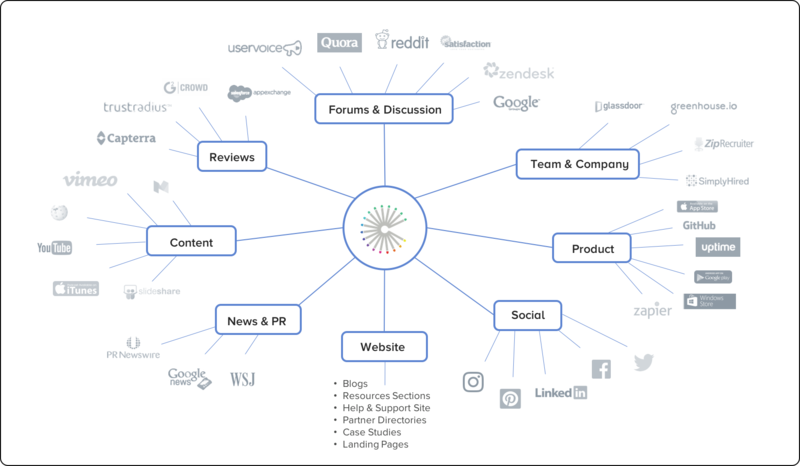 How do you track an ever-changing set of thousands of sources across tens or hundreds of companies in your market, and keep up with it in real-time? A decade ago, the digital footprint for most companies was pretty simple: corporate website, blog, and a few social media profiles. But those days are over. Today, the digital footprint for most companies is spread across thousands of places online, and the corporate website is just the tip of the digital iceberg. There are review sites and forums where products and services are being discussed, job boards and employee review sites, native apps in the iTunes and Google Play app stores, partner pages on other corporate domains, content being published on sites like YouTube, Vimeo, iTunes, SlideShare, and Medium. And don’t forget the Wikipedia page, financial results (if they’re public), and patent applications. It’s impossible for mere mortals to get their arms around the digital footprint for a modern company without software to do the heavy lifting. Crayon’s software detects digital footprints at scale to yield complete intel on companies in your market. 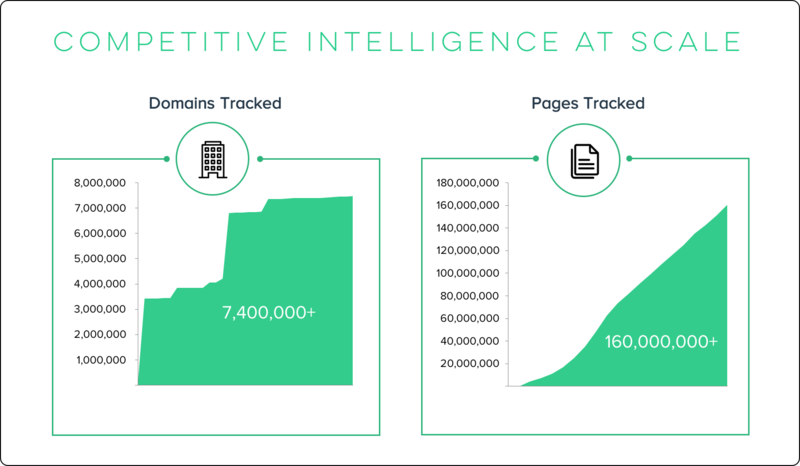 We’re tracking more than 160 million pages across 7.4 million domains, and we’ve triangulated the digital footprint for over 2.2 million companies. The second challenge blocking many companies from building actionable market intelligence programs is that digital footprints are extremely noisy. If you tapped into every change in a digital footprint, you’d drown in a sea of data. The footprint for a given company changes frequently, but many of those changes are immaterial. The home page changed… but only by a few pixels. There’s a new online review…. but it’s only 1 sentence. There’s a new LinkedIn post… about their office dog Mr. Tickles. Crayon’s solution to this challenge involves an ongoing investment in separating signal from noise at scale. We use algorithms, machine learning, and humans working in concert to filter out the noise so you can pick up on important signals. For example, only 6.1% of the website changes detected by Crayon are meaningful enough to be delivered to customers; 93.9% of website changes are nothing but noise! Once we’ve got signal separated from noise, we classify each signal into over 100 discrete insight types, and give you the ability to filter and analyze insights based on date, topic, and relevance. The net result is a market intelligence platform that’s comprehensive without being noisy; a tool that helps you analyze what’s happening without fighting through an avalanche of data. Challenge #3: How Do You Make It Actionable? You’ve got your intel. Awesome. Now what do you do with it? How do you make it actionable? This is the third challenge that’s historically blocked large-scale investment in market intelligence. Enterprise value isn’t created by market intelligence, it’s created by the decisions, actions, and strategic insights that result from market intelligence. This is a subtle but critical distinction: Competitive intelligence isn’t about what your competitors are doing, it’s about what you do in response. Competitive intelligence isn’t about what your competitors are doing, it’s about what you do in response. Companies don’t just need market intelligence, they need a prescription for action. They need a playbook and methodology that helps them figure out how to use the intel to drive action. The challenge is that most companies have historically lacked a playbook for making market intelligence actionable. Crayon has woven a prescription for action into our software platform, methodology and training process. Crayon customers drove more than ten thousand strategic and tactical actions using Crayon intel last quarter alone. Market intelligence software drives a 100x efficiency gain: 10x better intel, 10x faster. First, Crayon software will find 10x more valuable intel than what you could have found manually. Digital footprints today are massive, and manual efforts can’t capture all the changes taking place, and then separate signal from noise. For example, in a partner directory with 1,000 listings, a human is unlikely to note the 889th partner was replaced with a new firm. On a website with thousands of pages, a human will likely miss product integrations removed from a solutions page and newly published case studies. Second, you’ll get the intel 10x faster. Rather than waiting for a human-based workflow to deliver intel, you’ll get the intel in real time. The end result? Your team has 10x better intel in 10x less time. That’s a 100x efficiency gain and a massive ROI. Every team in marketing, from Demand Generation to Sales Enablement to Communications, as well as some teams outside marketing, will see their metrics get better as a result of market intelligence when they learn to translate market events into actionable opportunities. From increased campaign performance in Demand Gen, to better sales win rates against the competition, to better PR and content marketing results, market intelligence drives a lift in key metrics across multiple teams. A competitor sunsets one of their products and you train sales to use that intel to win competitive sales situations. You find candid reviews on a competitor’s product and craft a sales battlecard to increase your win rate. A competitor makes a splashy announcement, and you get ahead of the news in real-time and enable the sales team to understand and position effectively against the new development. A competitor launches a new AdWords campaign, and you turn their idea into an a/b test that opens up a new family of high-conversion campaigns. You see revenue drop and assume it’s related to something you’ve done, but then find a competitor introduced aggressive promotional pricing into the market, so you launch a promotion in response. A competitor implements an SEO best practice on their website, and you adapt the best practice to work for your site and roll it out. You identify a journalist that’s writing about the competition but hasn’t written about you, and reach out to build a relationship. You benchmark your PR effectiveness around a recent event relative to the competition, and identify ways to outperform them around coverage at future events. You see a competitor mirroring your messaging, and start to shift messaging to maintain differentiation in your campaigns. You see a competitor adopting new channels, like SlideShare or iTunes Podcasts, and you shift investment to those channels so as not to fall behind. A competitor launches a new content campaign, perhaps a series of videos on YouTube, a set of webinars, or a Pinterest contest, and you craft new campaigns based on those ideas. A competitor contracts their support hours, and you drive forward an initiative to expand your support hours to create a marketable differentiator. A competitor launches a new product that competes with you, and you see a gap in the feature set, so you update battlecards and train sales to highlight your relative strength. A potential customer asks a question on Quora or Reddit, and you engage to pull them into a sales conversation. Product Management: A competitor launches a feature that’s also on your roadmap, and the team reviews videos, documentation, and forum discussions showing how the feature was implemented and how customers are responding to it. Partnerships: A competitor drops a strategic partner, and your team capitalizes on the opportunity to pull that player into your partner program. HR/Recruiting: A competitor closes an office in a geography where you have a presence, and you move quickly to recruit displaced employees. The net impact of actionable market intelligence is positive results across many teams. All the metrics get better. Your team gets better campaign results, wins more deals, gets more press, and wins more customers. Companies that build market intelligence programs enjoy a lift in a wide variety of metrics across teams. You’ve probably got a great corporate strategy and a great marketing strategy. But the market doesn’t sit still, and you’re not alone in your market. If you don’t have a systematic way of adjusting your strategies in light of shifting market dynamics, you’ll miss important opportunities to get ahead, or you’ll find yourself on the wrong side of a shift you didn’t see coming. For example, consider a set of signals that indicate your competitor is investing in artificial intelligence. The first signal is they’ve posted two engineering jobs for data scientists. The second signal is they included the term “machine learning” in a newly published “product brief” on their help site. The third signal is they get a booth at an AI-focused industry event. A market-aware organization would connect the dots and realize their competitor is actively pursuing artificial intelligence now. The strategic action might be to accelerate your own plans to invest in artificial intelligence capabilities. Your strategy might have called for waiting 18 months to invest in AI, but it might make sense to accelerate those plans. What if a competitor is slowly changing messaging across their website to more closely mirror the language you’ve been using to tell your story to the market? What if a competitor you’ve been battling in the mid-market is moving upstream to the enterprise? You need to understand these strategic developments in real-time. There’s no simple formula for how you’ll respond to strategic issues. Anything can happen in the market, so almost anything might be justified as a strategic response. The important thing is to be plugged into an ongoing, agile cycle of market intelligence assimilation and strategic adjustment. The important thing is to have complete knowledge about what’s happening in the market, so you can act (or not) from a position of informational advantage. The vast majority of companies haven’t awakened to the market intelligence opportunity yet. That’s great news for you! You can be first in your market to use actionable market intelligence to build a sustainable competitive advantage. There’s a good chance if you don’t make the investment soon, someone else in your market will beat you to the punch. By the time you see their case study, you’ll be playing catchup. Wouldn’t you rather have them read your case study than vice versa? We believe the external market environment is today’s greatest untracked frontier for millions of companies. This is as important to understand as your website and your sales team, yet most companies have severely limited visibility. We believe millions of businesses can create meaningful enterprise value by accessing market intelligence at scale, and making it actionable. We believe most companies are on the sidelines today because there’s never been a great software platform to solve the actionable market intelligence problem at scale. We believe you can be the next Crayon case study. We’ve driven tens of thousands of strategic and tactical actions for thousands of customers, and we’d love to get you off the sidelines. If you believe what we believe -- or you want to chat -- leave a comment below, shoot me an email at jonah [at] crayon.co or request a demo.